Brown rice ambassadors @mikaeldaez and @kylienicolepadilla handing out brown rice to families in Brgy. Payatas, Quezon City. A social media challenge called #BROWN4good initiated by the Department of Agriculture and the Philippine Rice Research Institute (PhilRice) has received a massive hashtag support from the netizens, resulting in more than a million pesos worth of brown rice distributed to chosen charities nationwide. 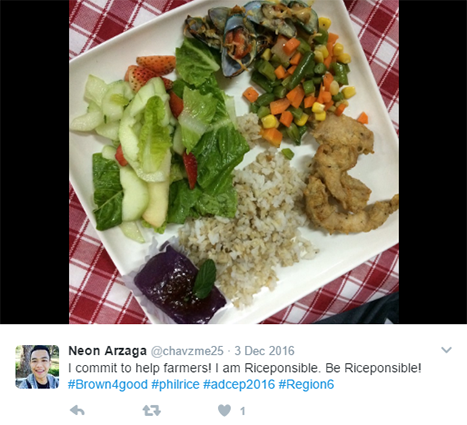 Carried out from August 28 to December 5, 2016, the #BROWN4good Challenge enjoined the netizens to consume at least a cup of brown rice, take a picture of it, and then post it on Facebook with a caption (#brown4good and their #region of origin). Every hashtag posted on Facebook is equivalent to 1 cup of brown rice to be donated to any charity institution of the region where the publisher came from. The turnover ceremony took place at the National Capital Region (NCR) where campaign ambassadors Kylie Padilla and Mikael Daez had distributed packs of brown rice to over 200 families in Payatas, Quezon City, January 19. They also helped serve brown rice arroz caldo to children in the said community in coordination with the local government of Payatas, Komunidad Kay Kristo (KKK-Payatas), and the ladies of Bayan Muna-Payatas. The rest of the brown rice donations for NCR will be given by ABS-CBN Foundation to over 400 families in the communities along the Pasig river. Meanwhile, regional donations have already started in the cities of Cebu, Davao, and Iloilo, among others. Beneficiaries include elders, indigenous peoples, street children, and drug rehabilitees at charitable institutions supported by the Department of Social Welfare and Development (DSWD). The #BROWN4good Challenge was a way to inform the public of the four goodness of brown rice. First is personal goodness considering its health benefits. Second is goodness to the farmers given the added value that comes from producing and marketing brown rice. Third is goodness for the country as brown rice has 10% higher milling recovery, thus, adding 10% to the country’s rice volume. The fourth goodness is for others such as the beneficiaries of the chosen charities who will receive brown rice for their consumption. “We’re happy that many were encouraged to eat brown rice because of the challenge. They had different motivations. We are glad they committed to eat brown rice regularly, with some even committing for life,” said Hazel V. Antonio, campaign director of the Be Riceponsible Campaign. Brown rice is unpopular among low and middle-income classes despite its health benefits because of its high price. By commissioning farmers’ cooperatives to be suppliers of good quality brown rice and linking them to retailers and food establishments, DA-PhilRice was able to make it available in major cities at P37-45/kg. “While it was made around 40% cheaper than in malls, farmers were still able to get income of as much as six times higher because of the project. Thus, consumers were able to afford it while also increasing the income of farmers,” Antonio added.“The #BROWN4good challenge proved that Filipinos are just deterred by the high price of brown rice. Given more affordable and accessible supply, more would be willing to embrace it for good. Thus, the challenge that DA would continue to address,” Antonio concluded. The #BROWN4good challenge is part of the bigger campaign dubbed as Be Riceponsible, a social mobilization initiative created to spread awareness on the value of every rice grain and to encourage the consumption of healthier rice options such as brown or unpolished white rice. “The #BROWN4good challenge proved that Filipinos are just deterred by the high price of brown rice. Given more affordable and accessible supply, more would be willing to embrace it for good. Thus, the challenge that DA would continue to address,” Antonio concluded.